I am waiting for a dog delivery. Her family is heading for vacation and I will be dog-sitting. She lived here for 6 months, so it's nothing new for her. The only problem is she jumps our fence. There will be a lot of leash walking in my future. Wow! First! That NEVER happens! Kathy & all who follow!! Congrats on first! Hope dog doesn't drag you around too much! But ... Batty ... the fence-leaping-in-a-single-bound pooch has to be a desirable alternative to the rabbit who leaves great mounds of bunny balls in inaccessible locations! It sure is, Judy. I'm feeling quite fortunate that I just have the dog. They got some other poor sucker to take care of the cats, rabbits, guinea pigs, turtle, and chickens. It's a zoo at their house. Some days folks begin with jokes or TFTD or life quips ...nice change with Kathy & Judy's exchange - giggles & smiles follow - thanks! TFTD = Terror from the deep? 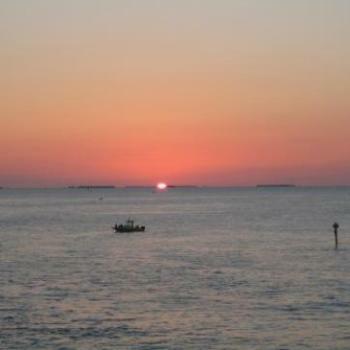 …...can't surpass those Key West sunsets no matter the viewing location! Ah, it's back. I kept getting ''can't be found'' and my smilies weren't working. Seems okay now. As far as Wombat's puzzles go, I work through the ones that are obvious to me, then the ones that seem vaguely familiar, then move the leftover letters around to come up with the things that could be, but I've never heard of. there were several in that latter category today. Aruba gives Key West good competition for best sunsets. Seven year old grand-twins went home yesterday evening after having them for the week. Love'em while they're here. Love'em when they go home! I rejuvenated a well-loved teddy bear while the twins were here - re stuffing and new paw fabric. My son wasn't too happy about it, though. They have been trying to get our grand-son to give it up - along with his thumb. Our son is now imagining our grand-son taking it to college with him! My ear twitch has returned today. Not pleasant! Imagine a helicopter or a Harley Davidson in your ear! The muscle that is twitching is inside my ear attached to my ear drum, so the twitch transfers into an audible noise. Eeeeeeeee! Good mAen, good people. I can't believe how fast this past week has gone. 2:05 Bit slow this morning. I was finally able to get out for a decent run this morning after two months being either out or severely restricted with a hamstring injury. A little over 26 kms of mainly trail this morning, it felt soooo good to be back out again! The birthday boy ... Rawabelong does sound like it could be an Aussie town. Rawa Belong in Jakarta, Indonesia, Keith. I did look that up, Peter. I was implying that pronouncing the word reminded me of the sound of the names of any number of Australian towns. I was actually disappointed to find out that it isn't one of them. Sounds great Chris. You must have been going stir crazy!